A Flying Rat in GTA IV. Plague of pigeons in the City. 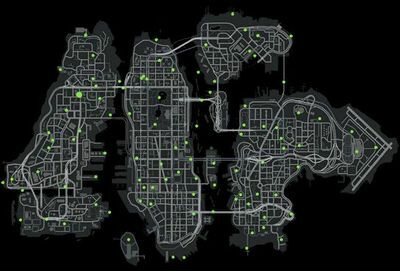 Flying Rats are 200 collectible pigeons located all around Liberty City in Grand Theft Auto IV which Niko Bellic must find and shoot, burn, blow up, or run down with a vehicle (either or). The pigeons are generally found in out-of-the-way areas, but can be easily noticed by the distinctive cooing sound they make and the red glow they're highlighted with (making them easier to spot at night). Killing all 200 Flying Rats adds 2.5% to the game completed percentage and also unlocks an Annihilator helicopter on a helipad near Star Junction in Algonquin. A continual risk when hunting is discharging a weapon will often trigger a wanted level. The "running over with vehicle" option does not apply to most of the targets, and Niko cannot use his fists or baseball bat to dispatch them. Shooting them from a distance using a sniper rifle is one way to avoid the wanted level. The in game website www.whattheydonotwantyoutoknow.com shows the location of the flying rats. Small dots are one flying rat, while large dots represent two or more. On Happiness Island, the large dot represents six flying rats. The map is not particularly useful, especially with multiple targets, except for providing general location. One Flying Rat is not represented on the website. This one is located on the far west/south-west side of Alderney (the far left island), on a construction site. Niko Bellic hunting Flying Rats in Alderney. 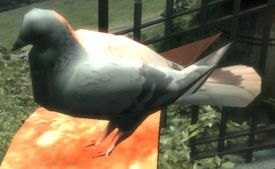 If one is playing with a low-detail graphics setting, some of the flying rats may not appear at a distance, even through a sniper rifle. Get closer to them in order to kill them: helicopters can be useful in this regard, especially near Francis International Airport. Despite the fact that the 200 flying rats gets the player an Annihilator, the helicopter hardly ever spawns if the player uses the window cleaning platform and has a better chance of it spawning by using a helicopter to reach the top, which is extremely illogical, unless the player is using another kind of helicopter and wants to use the Annihilator. 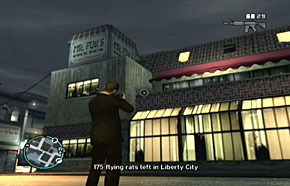 On several occasions, flying rat locations are revealed during cutscenes as they may appear in the background of a shot. Seagulls - The Lost and Damned and The Ballad of Gay Tony equivalent. This page was last modified on 20 January 2013, at 21:01.